263 pages | 30 B/W Illus. "It is hoped that, through this series, it will be possible to accelerate the process of building knowledge about policing and help bridge the gap between the two worlds—the world of police research and police practice. This is an invitation to police scholars and practitioners across the world to come and join in this venture." 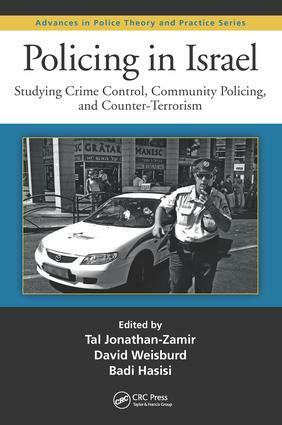 Tal Jonathan-Zamir is a lecturer at the Institute of Criminology, Hebrew University of Jerusalem. She earned her PhD at Hebrew University in 2010 and spent a year as a Fulbright postdoctoral fellow at the Department of Criminology, Law, and Society at George Mason University. Her research interests include police–community relationships, police discretion, police legitimacy, and policing terrorism. David Weisburd is a Walter E. Meyer professor of law and criminal justice at the Hebrew University Faculty of Law in Jerusalem and distinguished professor of criminology, law, and society at George Mason University. His latest book, The Criminology of Place: Street Segments and Our Understanding of the Crime Problem, was published by Oxford University Press in 2012. He is the recipient of many international awards, including the 2010 Stockholm Prize in Criminology and the 2014 Sutherland Award from the American Society of Criminology. Badi Hasisi serves as a chair of the Institute of Criminology, Hebrew University of Jerusalem. His main research focuses on policing divided societies; police–minority relations; law, history, and society; and terrorism and airport security.